August 1565: When a rival artisan turns up dead outside Ginjiro's brewery, and all the evidence implicates the brewer, master ninja Hiro Hattori and Portuguese Jesuit Father Mateo must find the killer before the magistrate executes Ginjiro and seizes the brewery, leaving his wife and daughter destitute. A missing merchant, a vicious debt collector, and a female moneylender join Ginjiro and the victim's spendthrift son on the suspect list. But with Kyoto on alert in the wake of the shogun's recent death, a rival shinobi on the prowl, and samurai threatening Hiro and Father Mateo at every turn, Ginjiro's life is not the only one in danger. Will Hiro and Father Mateo unravel the clues in time to save Ginjiro's life, or will the shadows gathering over Kyoto consume the detectives as well as the brewer? 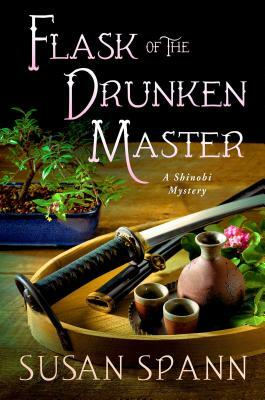 Flask of the Drunken Master is the latest entry in Susan Spann's thrilling 16th century Japanese mystery series, featuring ninja detective Hiro Hattori and Jesuit Father Mateo.